"I had a question. As you know, I am a Marine and our fitness test requires a 3 mile run in 18 min. I want to improve my current time. With all you years of experience, I thought to get some tips to reach a targeted time, who would be better then to ask you. What would you suggest? How do you improve your running time on a set distance?" Assuming that you are already doing some consistent training, I refer back to the May article I posted on interval training. Interval workouts are generally run during the middle of a week, however you could do them on a weekend if you are not racing. As you become more comfortable with this type of training and your 3 mile test is about 4 weeks out, you can also add another tempo run on the weekend. Use it as a race simulation- go for 1 mile at your 6 min goal pace, rest 5 min, then repeat. Another option would be a 1.5 mile time trial- bringing that time down should translate to a faster 3 mile. I've found that a 1.5 mile time trial is a great way to simulate racing a 5K - you are exposed to a fast pace and the same type of fatigue you'll experience running a 5K but the shorter distance is much easier to handle. Three or 4 of these before your test will make a big difference. Remember, you need to be fresh going into these tempo and interval workouts- nothing too long the day before. Finally, for additional strength you can slow increase one run per week so that you are going 60 min or longer. Run these at an easy pace- you are building resistance to fatigue and not speed. This gives you 3 key workouts per week to focus on- 1 interval session, one tempo session, and one easier, longer session. Give it some time and let me know how you are doing! Don't know which running shoe to buy? This article published in the January 2005 issue of Physician and Sports Medicine titled The Running Shoe Prescription does a great job of explaining just about everything you need to know. If you are lucky enough to live in a community with a good running shoe store, (Striders Specialty Running Store here in Layton, Utah has the best customer service I've seen and offers a free computerized foot and gait analysis) you should always go there to make your purchase. As you become more familiar with the type of shoes that work for you and you know your size, you might be able to save some money by shopping online. Another excellent source for help picking out shoes is Road RunnerSports. 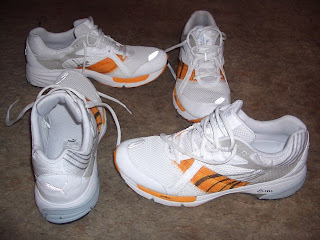 If you find a shoe you think may be for you, I would always check the runner's reviews here first.